Build your own friendly monster! Choose different body parts to help explore the world and uncover each unique island. Discover fun creatures, musical scenery and hidden surprises as your monster plays in this magical kingdom. A free play imaginative landscape helps children to be creative, building the creatures they want and learning what is needed to fly high, swim fast or simply walk around. Can you find all 40 body parts? I am very proud and honoured that Monster Mingle won 2nd prize at Digital Ehon. This is my first award for an app that I have made, so we are happy to receive this. 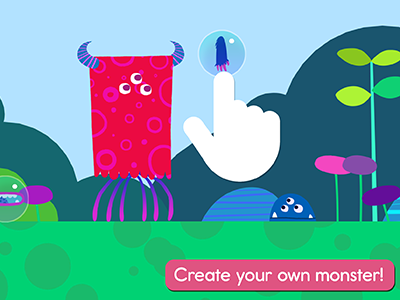 In Monster Mingle I wanted to create an app where children could make their own monster. Of course there are many monster making apps that exist already, but once you create your monster you can’t do anything with it. I wanted to create a world full of wonderful things to find, but to find them you had to pick body parts for your monster that would let you fly or swim. You can find new body parts in the world and change them back if you don’t like them. The fun comes from trying out new body parts, see what you like and finding unusual foods. I hope that you enjoy my app, and I would love to hear your feedback. “At first glance, the monster looks scary. But by choosing the body parts, walking through the fields, swimming in the water, it makes you feel as though you have become the monster. Even for a scary monster, you start to realize that the monster has warm emotions and feeling of love towards friends and nature. This is a digital ehon that broadens your possibilities, and nurtures imaginative minds to understand other people’s thoughts. 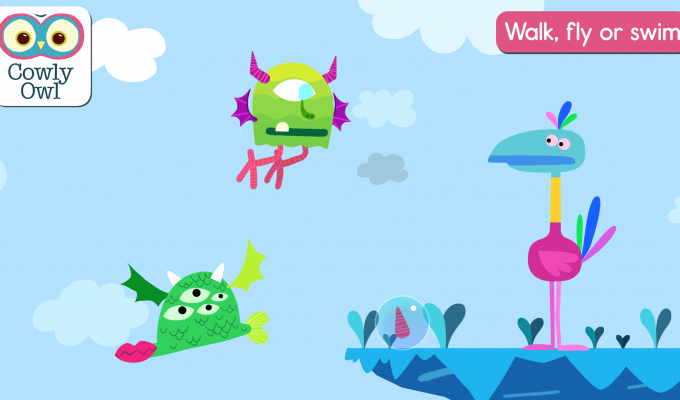 Children can explore the beautifully illustrated world using a monster. The monster can acquire additional body parts with various functions throughout the adventure, and can even exchange it with the existing one. This idea was very interesting. There is no fixed storyline, so the reader can make their own story while exploring the world. Personally, I would like to see a broader world other than the land, sea, sky, like a town or a mountain.